A community centre in Christchurch’s new retirement village has been recognised for its colourful style and sophistication, with Kovacs chairs helping set the scene. With 101 villas, 73 apartments and 100 care beds the $80 million Lady Wigram Retirement Village has a number of enticing features for those wanting to spend their golden years in style. 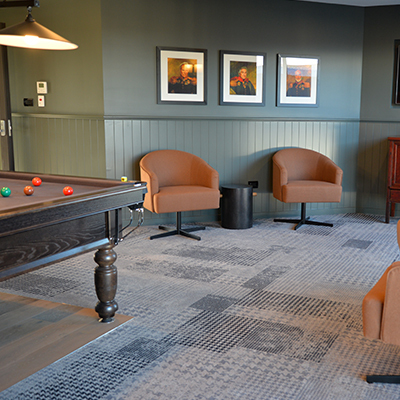 Chief amongst these attractions is the village’s luxurious Club House, a community centre with a restaurant, bar, billiard room, movie theatre and library. Working with the immensely talented Georgie Kirkcaldie from Kirkcaldie Commercial Interiors we helped scope and produce a variety of chairs for this space. An initial production order of Jed, Taylor and Louis chairs was put through. Since then more Taylor chairs have been ordered, with this design proving popular at the village. Choosing the right chair design for retirement homes and luxury resort-style villages like the Lady Wigram complex requires a number of different features be correctly assessed. Couches and chairs that are too soft, too low or too deep are out of the question – people must be able to easily sit and rise from the chair without resorting to a rocking motion or uncomfortable scrambling into position. So too must the chair’s base be heavy enough to push or lean on without moving too dramatically. A solid armrest is also vital – these features are helpful when sitting down or standing up. In this respect the front of the arm also needs to be flat and easy to grasp hold of from a sitting or standing position. Fabrics need to be efficiently cleaned and durable. 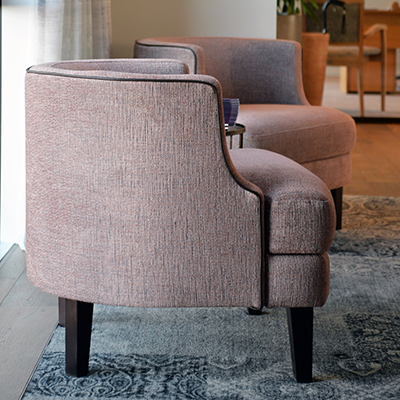 Quality construction is also important – because a favourite chair needs to be there when you need it, year after year. At the Lady Wigram Retirement Village we worked with Georgie to ensure this functionality could be delivered along with the requisite style needed for such a luxury setting. Georgie’s hard work has paid off. 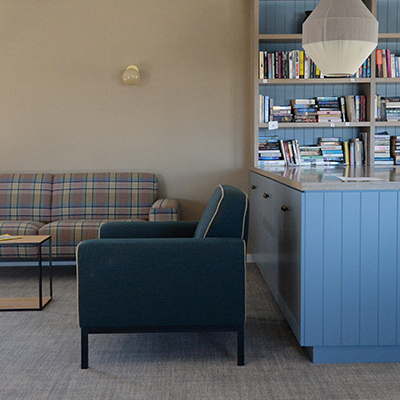 Not only is the Club House space uniquely evocative, comfortable and beautiful, it’s also been recognised in the annual Dulux Colour Awards.